I sell what I love, including primitives and many one-of-a-kind pieces built from reclaimed wood and architectural salvage items. Typically my pieces have simple (usually rusty) embellishments. My retail space is designed to spark ideas for creating warm, relaxed homes full of personality. I decorate with artful details like vintage books displayed in color blocks, hand-painted quotes, and lots of cool & funky accessories. 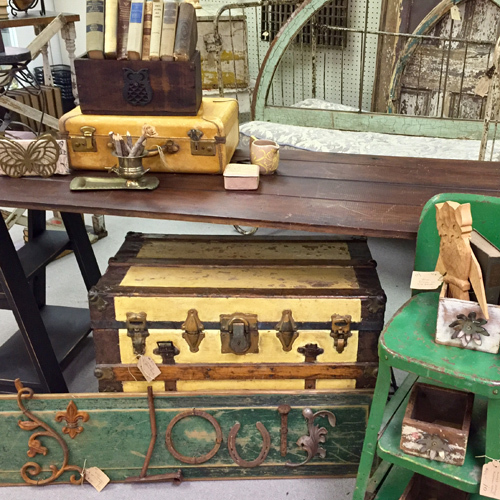 Come into Warson Woods Antiques to see my unique brand of earthy-vintage style, and get inspired by this creative mix of furniture & other home decor items.